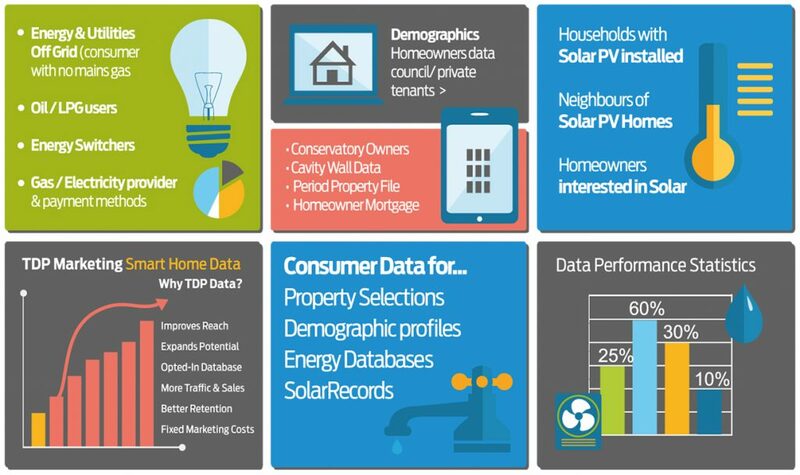 TDP Marketing provide opted-in consumer and homeowner data. It’s perfect for any business who needs to speak to householders, from solar and insulation installers and home energy providers to suppliers involved in the home improvement sector or building trades. We can provide you with fully compliant home marketing data from our internally-held databases to identify consumer and property-related marketing opportunities. Our data services team are all knowledgeable in their respective backgrounds from diverse business sectors: insurance data, home-energy, financial marketing, retail & publishing backgrounds. We transact data every day and have in-depth experience in helping marketers and data specialists across a broad range of sectors. TDP Marketing source and deliver the exact data needed to support your strategic and tactical marketing. It’s the marketing fuel behind some very big brands, and we’d love you to be one of them. One of our dedicated data consultants will work with you to count and segment the data you require to target the right people for your product or service. We work with a wide range of clients from start-ups to large corporates. However niche your business is, chances are we’ve provided data for that sector previously. Your information will never be passed onto 3rd parties, and is used for this business interaction and to keep in touch about marketing.Call us on 0844 561 1133 or email us us today to see what value we can add to your consumer marketing campaigns. Data Delivery Requirement When's it required? Thank you for your submission. Your data count request has been submitted.We will be in touch with you shortly.